Getting screwed while everyone else is getting laid. "I've just sensed a disturbance in the interest rate! It's as if a million dollars were screaming out and suddenly silenced." I am absolutely sick to death of reading about the federal interest rate. Don't they understand that no matter how many times they talk about it, no matter how much they explain it, they are never in any danger of getting me to understand or care about it? Every story about the federal interest rate is invariably accompanied by a picture of Alan Greenspan's craggy face looking pensive, thoughtful, sad, etc. 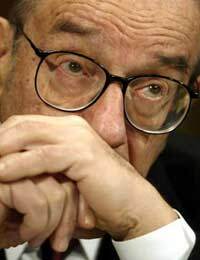 The interest rate drops (or rises, whichever is worse) and you get a picture of Greenspan massaging his forehead with a thoughtful look on his face. 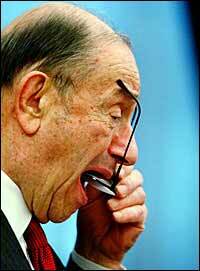 The interest rate stays the same and Greenspan will be pointing at something or just looking kind of bored. 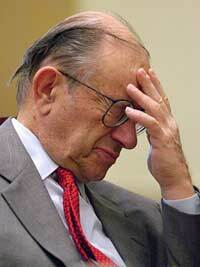 Sometimes Greenspan will appear sad and droopy like a puppy who just crapped on the rug. He's at that crucial stage in puppy cognitive development where he knows that he has done something wrong, but he just can't help it. He's still a puppy, you see? "I've been a bad, bad boy!" If things get good and the interest rate goes down (or up, whichever is better), you will, at best, get a picture of Alan Greenspan looking mildly shocked. I can't speak for all Americans, but I'm going to anyway: Not only do we not care about the interest rate. We don't understand it. We never will. Those few Americans who do understand it certainly don't seem to have the same emotional investment in this silly made up percentage that Alan Greenspan does. So the end result it creating a sense of connection between the casual reader (read: me and other dumb Americans) and Alan Greenspan's well being. When I read a story about the interest rate and there isn't an image attached I just wonder how it's affecting Alan Greenspan. If I don't see a picture and the news seems bad I think, "Oh man, I wonder how Al is taking it." Alan Greenspan seems like a nice enough guy and I don't want him to be unhappy. If the only affect of the interest rate is to affect Alan Greenspan's mood (and as far as my second grade level of understanding goes, it just may be) then I want nothing but good things for the interest rate. I couldn't wish sadness, despair and heartache on that poor old man. His obvious emotional ties summon a multitude of questions. Does he control the interest rate? Why is he so sad when it goes up (or down)? It looks like he's disappointed in himself. Is he just the interest rate's biggest fan? Does he watch the interest rate like a sports fan and subsequently cheer when it does well and get upset when it fails? The expression Alan Greenspan prepares each year for his surprise birthday party. He doesn't have the heart to tell his family that he knew all along. Alan Greenspan preparing to commit ritualistic suicide by ingesting his glasses, the ancient custom of the Federal Reserve Board. One possibility is that Alan Greenspan is a type of cyborg that is somehow directly linked to a computer feeding him a never-ending string of numbers, representing all manner of global monetary transactions. Another possibility (and this is probably the most likely) is that he is merely a fictional character, an embodiment of the Federal Interest Rate, a mascot if you will. He is the Spuds MacKenzie of the Federal Interest Rate. All he really needs is a snappy catch phrase. I suggest: "Hey, who's interested?" I prefer to imagine the latter hypothesis, that he is a human embodiment of the interest rate the puts a human emotion on it so that the rest of America can understand it. While that may be a little far-fetched it is probably closer to the truth than anything else I have managed to uncover. So why not create a system whereby a scale of Alan Greenspan expressions is used to determine the current state of the interest rate? It would be simple enough. 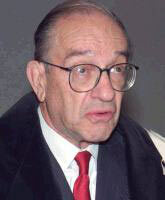 As far as I can tell, Alan Greenspan has fewer than seven facial expressions. Why not code a simple program to run on your average Windows XP computer in the same fashion as Weatherbug? That way you could simply glance down at your system tray and make note of the day's weather and the state of the federal interest rate. All in one glance! "It's a little chilly today, and Alan Greenspan's heart is filled with despair."